Before 1786 Penang was covered with jungle. The place was nothing more than a swampy, malaria infected island then. Nobody wanted to live on this impenetrable island. Thanks to the English captain Francis Light of the East India Company the island developed quickly. He had chosen Penang as harbour for ships on their way to China. On that long trip to China, where they got tea and opium, they could get fresh food and water in Penang. The soldiers of the East India Company, who had to clear the island from its jungle, complained about the site, which Francis Light had chosen to build a settlement. It was hard work to undo the island from its trees and of its thick undergrowth. To clear the place Light loaded the guns of the ship with silver dollars and fired them into the jungle to encourage a faster clearing by the labourers. Now the work was quickly done and in August they could already use Fort Cornwallis. To encourage settlers the port was given a duty free status and new arrivals were allowed to claim as much land as they could clear. Nowadays there are many modern factories, like Siemens, Bosch, Blaupunkt, Osram, Makro. Beside this industrial side of the island, there is also a tourist side: Batu Ferringhi. The best hotels are situated here like: Rasa Sayang, Golden Sands, Lone Pine, Holiday Inn, Parc Royal, Casuarini and Bayview Beach. There's also a complex with apartments: Sri Sayang. Up till now there are still building activities in Batu Ferringhi. The Rasa Sayang is the famous Resort. It was the best hotel of the world (1985) according to a British Tourist Organization. It's situated, like all the other hotels, along the beach of Batu Ferringhi. Here you can do all kind of water sports, like banana boat-riding, jet ski, parasailing, catamaran sailing and so on. The seawater at Batu Ferringhi is not clear and there are a lot of jelly fishes in the water. This is due to the industrial development of Penang and because of the fact that the environment is neglected here. In the evening there are a lot of market stalls and restaurants along the road. You can buy the Rolex watches, T-shirts, belts, music cd 's, Play station games here. Everybody is shopping in the evening. Twenty kilometres from Batu Ferringhi lays George Town. A bus ride to town will cost you RM 2. You can also take a taxi to town for RM 20. Don't forget to deal about the price, before you get in the taxi. Maybe it's cheaper for you than for me! Some hotels have a shuttle bus to town (Rasa Sayang/Golden Sands). Most people from Penang are Chinese, although there are also a lot of people from Malaysia and India. It's not surprising that George Town looks like a Chinese city. The busy streets are full of signboards with Chinese characters on it. George Town has an undeniable Chinese "look". The best way to do that is: by feet!! While you're walking, you discover most of everyday life of the Penangites. It's a pleasure to discover the city this way. If you don't want to walk, you can take the bus or taxi. But the most comfortable and easiest way is the trishaw. Sitting lazily in the seat of a trishaw, you can enjoy the colourful city. A trishaw ride in the evening is very special. They all have little lights on their bikes. All those lights glitter in the dark like glow-worms in the forest. A picture of the Rasa Sayang Resort The most famous hotel of Penang. The most favourite excursions will take you to the Botanical Garden, the Reclining Buddha, the Kek Lok Si, Butterfly farm, Batik factory, the Snake Temple, Fort Cornwallis, Penang Hill and the Tropical Fruit Farm. In the Thai Wat Chayamangkalaram Temple ( known as: "the temple of the reclining Buddha") you can see a 32 meter long Buddha who is lying down. Behind the statue are niches where urns, containing the ashes of devotees, are placed. Taking pictures of the Buddha is forbidden, but I guess you can try it. Outside the temple are two giant, angry looking guards waiting for you. Bright Naga Serpents form the balustrades along the walkway. Inside the temple you see (beside the Buddha) bald headed monks walking on tiles, with lotus flower on it. At the other side of the road is a beautiful Burmese temple. Most people forget to visit this temple, because it's not a tourist attraction, but it's worth a visit. Don't forget it! Penang Hill (Bukit Penang) rises 830 meter above sea level and is the highest mountain on Penang. A fascinating little cable train lifts you up out of the heat to a fabulous view and a cool breeze. Here you can enjoy the panoramic view of the city and the coastal area. The train was not made for tourists. In the colonial times Penang hill was the retreat for the British administration. It was an escape from the heat of George Town. Nowadays there are 500 people living on the hill. There are stations where people can get on and off the train and goods are delivered. The train has a special wagon for the goods in front. Air Itam is about 6 km from George Town. Above Air Itam you see the pagoda of the Kek Lok Si (Temple of Paradise). It is the largest Buddhist temple in South-East Asia, it is built on an extensive area and it is dedicated to the Goddess of Mercy. Behind the Kek Lok Si rises a bronze statue of this Goddess. Now (2001)they are building a nice temple for her up there with beautiful carved stones, which are delivered in boxes from China. Don't forget this temple is under construction. At the Kek lok Si there are several buildings, but these are dominated by the pagoda of the ten thousand Buddha's. If you like, you can climb the pagoda. If you follow the road up the mountains, you'll come to a little lake. It's the reservoir of the water supply company. It's cool and not so hot as in town. In these quiet surroundings you can have a walk and enjoy the beauty of nature. The lake is surrounded by casuarinas trees. You see big fishes in the water and at the shores iguana's. There's a waterfall in the background. On holidays and in the weekends Penangites come here for jogging and enjoying the nature. 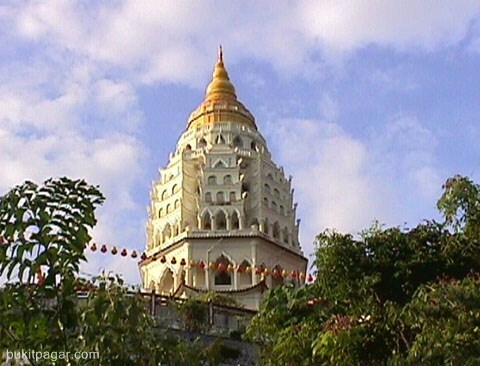 The famous pagoda of the Kek Lok Si. The Snake Temple is along the highway to Penang International Airport at Bayan Lepas. When you enter the temple you'll see snakes everywhere. They are lying on altars, vases, tables. Outside is even a tree for the little snakes! You'll be fascinated by the snakes, because they move freely around the temple. In a adjacent room are photographers, who make pictures of you with snakes around your head, neck or arms. These snakes have no poison fangs. Anyone in for diving or snorkeling? Book a trip to Pulau Payar . That's a small, beautiful, coral island, South of Langkawi. A snorkelling package will cost you RM 160 (2002). This includes: transportation from your hotel, boat trip, lunch and snorkelling equipment. The coral reefs of Pulau Payar offer you a mix of tropical fish. Also an excursion (daytrip by boat) to Langkawi is possible. Since 1988 the Penang Bridge connects the island with the mainland (Butterworth). 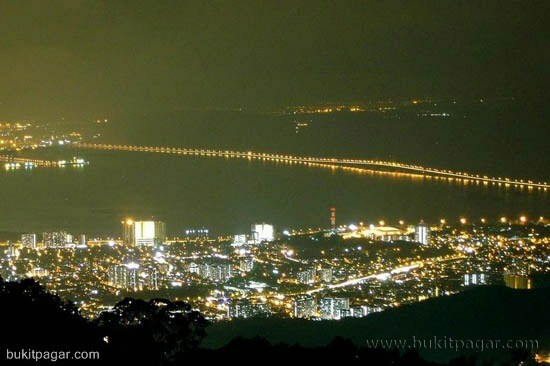 Penang Bridge is a toll bridge (RM 8) and 13,5 km long. You have to pay on the mainland. It was built by the Koreans. In the middle of the bridge we stopped to make a picture, but that's not allowed except in case of emergency . Nowadays there are plans fora second connection. This should be a combination of a bridge and a tunnel. This would be situated at Tanjong Tokong. On the mainland lies Butterworth. From George Town you can reach Butterworth with the yellow double-decker ferry. Many people prefer the cheaper ferry above the toll-bridge. In Butterworth there are a lot of factories. Especially in the morning and evening the ferry is full of labourers, who have their job in Butterworth. Some people call Butterworth: the Birmingham of Penang. In Butterworth you can also take the train to Thailand or Kuala Lumpur. The train goes twice a day. We tried to travel by train from Kuala Lumpur to Butterworth. Departure time in Kuala Lumpur was 4 pm. Time of arrival in Butterworth would be 10 pm. Then the boat, taxi-ride.......we decided not to take train, but you can always try. Penang is also famous for its food. At Hawkerstalls (visit the site) you can eat for RM 2 - 4. Then you get a wonderful meal. The real Penangites love the food so much, that they have a warm meal in the morning at the hawker stalls. Of course you can also eat Western food: steaks, spaghetti. But you can also have fast-food: Pizza Hut, McDonalds or KFC. However, I prefer the Penang food.